Hildegard of Bingen was a medieval mystic, the Catholic Church considers her a saint. Moreover, she was the first female composer whose works were documented. Basically, they are connected to the Georgian Chant and full of deep religious and spiritual emotion. For Hildegard music was like remembering the Garden of Eden, when there was harmony between the first people and the heavenly creatures. She thought that singing should be an integral part of the liturgy, bringing people closer to God by worshipping the creator with singing. There is a collection of her spiritual songs (symphonia armonie celestium revelationum) including 77 liturgical songs and melodies about Hildgard’s world of visions, images and thoughts. Her music is unique in the Gregorian musicology, it is characterized by a wide compass with big intervals like fourths and fifths. In modern classical and pop music there are hints to her music by people as different as Sofia Gubaidulina, David Lynch or Devendra Banhart. 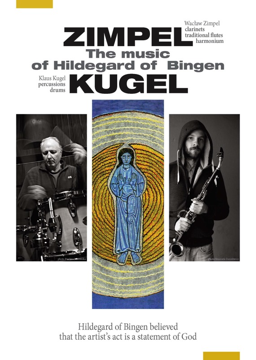 The uniqueness of Hildegard’s music is exactly what inspired Klaus Kugel (dr, perc) and Wacław Zimpel (clarinets) to create a modern ritual with its core set in the European musical tradition. The percussion’s use of space makes one think of a medieval cathedral or a monastery with endless cloisters. Hildegard’s melodies flawlessly merge with the clarinet‘s improvisations, Zimpel uses them as a starting point for his own interpretation. It is meditative music, very quiet and tentative, and although Kugel uses his drums as another melody instrument, he also delivers a very reluctant pulse here and there, which gives the improvisation a special magic. I am not sure if physical copies exist but you can listen to the complete album here. There's a link to a YouTube clip on the same page. It sounds rather good, but I'm still not clear as to how to get the downloads. I’ve just discovered that there are four albums of Hildegard’s music played on guitar by Noël Akchoté, and they’re available on Amazon and iTunes. This might present a moral quandary for Martin, but for those who are a complete moral vacuum (such as myself) no problem at all. ;-). But you can easily avoid amazon and i-tunes (if necessary) by downloading the stuff on bandcamp. As you know, I am less dogmatic than you suggest - but thanks for the recommendations (very interesting stuff). And last but not least: Yes, I am a guitar head too :-).